Hi, I am new to this site and I hope I am posting in the appropriate section. I would like to get in contact with any member that has information on the Wise lock company out of Cleveland Ohio. I would like to know about the company history, sales ads, store displays and product line. My interest came about through my prewar bicycle hobby. I collect Cleveland Welding Company prewar balloon tire bicycles. The Wise lock company made an exclusive frame mounted fork lock for CWC in 1937 for their top of the line Supreme bicycle. Wise also made several other locks for the bike industry. I have also seen a locking gas cap for the auto industry. What else did they manufacture? Does any member have any information on this Company? any resident experts out there? I would also like to purchase a few locks that have eluded me. Thank you very much and I appreciate any help and information. I have two Wise locks and some information. They were described in the Journal of Lock Collecting March 2002 pages 3-10. The journal is published by the American Lock Collectors Association (ALCA), http://alca.name and https://www.facebook.com/AmericanLoc...orsAssociation; I believe the association is still run by Bob Dix, who is a member here. The article is entitled "The locks of Solomon Wise." I doubt if it would be proper to scan and post it here. 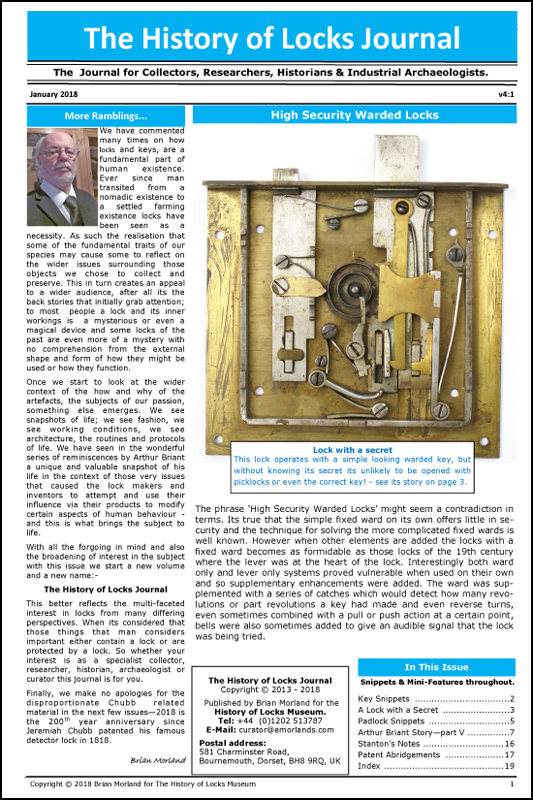 The same article was reprinted in the Journal of Lock Collecting January-March 2015 pages 4-12 possibly with some revisions. 2,140,490 (1938), figures 10-12 in particular. This has opened a few doors for me. I will search for those articles you talked about. Yes, I did find that post but it seems that nothing else is mentioned on this site regarding the Wise lock. (c)1990 by Jack Roberts, CML; see thumbnails attached. The National Publishing Co./National Locksmith magazine is currently in limbo and I don't think the book is available for purchase at this time. highly recommend the ALCA and there magazines are very good. The edition mentioned above jan-march 2015 has a great article in it about Wise locks . Where can I get a copy of the Jan-March 2015 ALCA magazine ?